Kansas’ state senate on Friday approved a bill banning an abortion procedure commonly used to terminate pregnancies in the second trimester, a victory for anti-abortion activists in what could become the United States’ first ban of this method. The procedure, known as dilation and evacuation, involves dilating the woman’s cervix and using tools to remove the fetus and any remaining tissue from the uterus. Abortion rights activists say that the procedure, which is used in about 8 percent of abortions in Kansas, is the safest and cheapest option for women looking to terminate pregnancies in the second trimester. The bill passed by a vote of 31 to 9 and would ban the removal of the fetus using clamps or forceps. 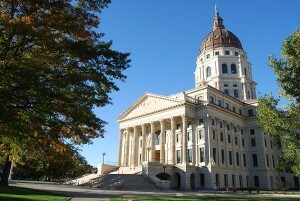 It will go to the Kansas House of Representatives next month, and if it passes, Kansas will be the first state in the country to ban the procedure. Similar bills are currently being discussed in Oklahoma and Missouri. “That’s a very gruesome practice that needs to end,” State Senator Garrett Love, who introduced the bill to the senate after seeing his daughter’s 12-week sonogram, said in an interview with PBS NewsHour. “I think that when it connects with people that babies between 13 to 18 weeks are having their arms torn out and killed, they are outraged by this,” he said. But abortion rights activists say the procedure is the safest option for many women. Substitute procedures, including extraction and induction procedures, carry greater risk of infection and may cause more bleeding, Julie Burkhart, founder of the Trust Women Foundation, said in an interview with the NewsHour. The Trust Women Foundation operates a clinic that performs abortions in Wichita, Kansas. “What the legislators are proposing is to tell the physician that they know what’s best when it comes to the practice of medicine,” said Burkhart, who worries the bill will force women to seek services in other states or to go to unqualified physicians for the procedure. Dilation and evacuation is also much cheaper than alternative methods of abortion. Burkhart’s clinic charges between $800 and $2,050 for the procedure, compared with triple the price for inductions. “Our women are really going to be put into quite a predicament,” she said.